Will this become an increasingly rare sight? 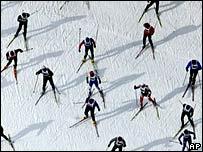 Global warming could make some Alpine ski resorts unviable within decades, a study has warned. The Organisation for Economic Co-operation and Development (OECD) said sufficient snow may become a thing of the past on lower-lying slopes. It found that recent years had seen the warmest winters on record in the Alps and that climate projections predicted even higher temperatures in the future. Some Alpine resorts have already warned of insufficient snow this winter. The OECD report said ski resorts in Germany were most at risk of becoming unviable in the future. It said areas of the Austrian and Italian Alps were the next most vulnerable, followed by some slopes in France and Switzerland. OECD official Shardul Agrawala said some smaller operators on lower slopes were "already closing up". He added that the report's findings come as banks in Switzerland are already refusing to lend money to ski resorts below an altitude of 1500 metres. The OECD's study covered 666 Alpine slopes. It found that at present 90% of the 666 slopes had enough snow cover for 100 days or more each year. But the report warned that just a one-degree centigrade rise in average temperature would reduce this to 500 viable slopes, and that this was likely to happen between 2020-2025. It added that a two-degree rise, which some predict by 2050, would further drag down the number of viable resorts to 400. "Tourism in the Alps is a key contributor to the economy of Alpine countries," the OECD said. Between 60-80 million tourists go on winter holidays in the Alps each year. The OECD is a Paris-based global economic think tank.